Electric golf carts are versatile vehicles that provide great transportation in a variety of situations. Even though they are called golf carts, they aren’t just great for golf enthusiasts, but for people living in retirement communities or overseeing construction sites where quick travel is necessary. Golf carts can be very expensive when purchased new, which is why many people choose to purchase used golf carts. You can save up to 50 percent on the purchase price! What should you look for in used electric golf carts vs. a gas powered cart? Before we get ahead of ourselves, work out a budget of how much you can reasonably spend on a used cart. Some other things you should think about are size and features. There are so many features that you need to consider as a buyer when shopping for used golf carts. Some of these features you find you can’t live without, but others you can easily overlook. 1. Windshields: Some electric golf carts come with windshields permanently affixed and others allow you to fold the windshield down. This is especially something to consider in areas of unexpected weather patterns. 2. Seat material: Leather is the most luxurious seat material that one can purchase when considering a golf cart. However, other lesser materials can save you money. 3. Radio: If you enjoy listening to music or the news, shop for used electric golf carts that contain a built-in radio. 4. Rear seats: If you are looking to maximize the number of individuals traveling in your golf carts, rear seats provide extra space in the back of the golf cart. 5. Mirrors: It is necessary that you find a cart containing side and rear-view mirrors in order to ensure you have clear visibility behind the cart. 6. Horns: If you plan on using your cart on a public road, horns are necessary to alert people of your presence. 7. Headlights: Depending on where you live, or whether or not you are looking to drive your golf cart at night, you may be required to purchase one with headlights. Before making the plunge to purchase the used cart, make sure you evaluate it based on the points below. 1. Pay attention to the tires on the golf cart. They should have deep treads and minimal wear. If you find the cart you want, but it has worn tires, it can cost up to $90 to replace each tire. 2. Check the canopy of the cart for any rust or damage. Rusted canopies are a sign of bad things to come as the rust will only become worse over time. If the canopy feels unstable, it can be a sign of poor workmanship and should be avoided. 3. The body of the cart itself is very important. It should be in good shape cosmetically, but it should also be structurally sound. Only buy a cart with minimal damage and very little or no rusting. 4. Inspect the battery of the cart. You can get more use out of the cart if the battery is newer. If you need to replace the battery, you can expect to pay up to $600. 5. Go for brand name carts that you recognize. Brand names are usually more reliable and contain higher quality parts. 6. Opt for Reconditioned golf carts as opposed to as-is carts. 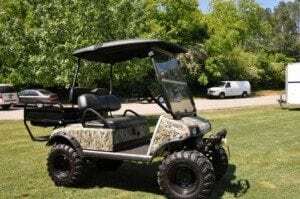 Reconditioned golf carts were professionally fixed and some portions may have been replaced. If a seller claims as-is, you get no warranty and no one to blame. Purchasing used electric golf carts isn’t hard, but you need to find a reliable seller. You can save a lot of money by knowing what to look for and avoiding deals that offer no way out!